The Accimap program allows you to conduct a systems analysis of the causal factors involved in your incidents. It is a special analysis tool, separate to the database, to summarise the causal factor and relationship data entered into the database. You can create an Accimap based on all records in the database, or a subset (e.g. only incidents involving a certain activity, or only incident associated with adverse outcomes). This information can help you identify the causal factors that reoccur across programs and activities. NOTE: You will need to have Google Chrome installed on your computer in order for the Accimap Program to work. Download Chrome for free here. 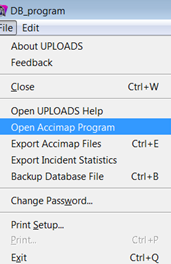 The first time you create an Accimap, you will need to configure the program for your computer. 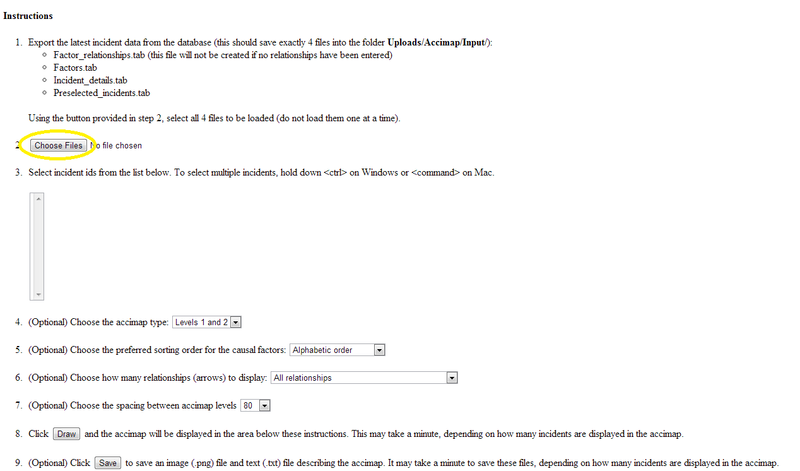 You only need to do this once, unless you move the UPLOADS folder to another location on your computer. 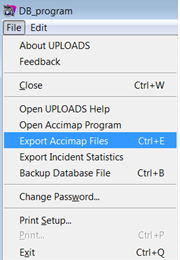 Open the drop down box from the “File” menu, and click on “Export Accimap Files”. A box will appear, click OK. This will open the program in Google Chrome, click on the “Choose Files” button. Information will appear in the space under Instruction 3. Click “draw” and this will generate the Accimap. 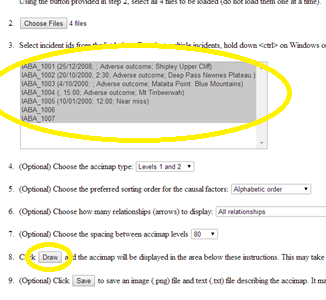 Click “Save” – this will create a text file which includes all the descriptions of the factors and relationships, and a diagram you can save.